Over an off-white ground, black underpainting indicates shadows in the woman's back. An ocher layer top of the ground may cover the entire painting. It is not covered by any other paint layers in parts of the figure and in the stained glass window The woman's yellow jacket underpainted with white, followed by lead tin in the light parts and two layers of a black and yellow ocher mixture in the shadows. In the flesh colors are various mixtures of white, ocher, and black, well blended into one another. The pearl necklace was painted wet-in-wet white over a gray/ocher layer. The Woman with a Pearl Necklace portrays a woman gazing into a mirror while holding two yellow ribbons that are attached to a pearl necklace she wears. Silhouetted against a white wall, she stands behind a table and chair in the corner of a sunlit room. Vermeer, in this painting, used the compositional format he followed in the Woman in Blue Reading a Letter and A Woman Holding a Balance, but gave it a more dynamic character. 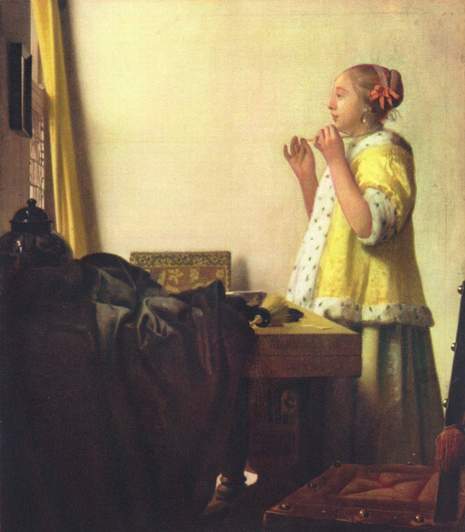 In each of the other paintings Vermeer concentrated on the inward thoughts of the woman and conceived of ways to present self-contained images. Likewise, in the Woman with a Pearl Necklace he minimized the apparent physical activity of the figure, portraying her at the moment she has the ribbons pulled taut. Her thoughts may be inward, but they are expressed through her gaze, which reaches across the white wall of the room to the mirror next to the window. The whole space between her and the side wall of the room thus becomes activated with her presence. It is a subtle yet daring composition, one that succeeds because of Vermeer's acute sensitivity to the placement of objects and to the importance of spaces between these objects.